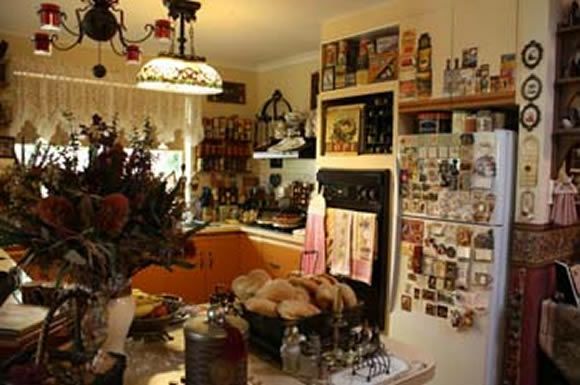 From the front gate to the back door and beyond, inside and out – and every nook in between – the home of Julie Craig and husband Andrew evokes marvellous memories of times past, of loved ones and special friendships, of happy days and distant recollections. 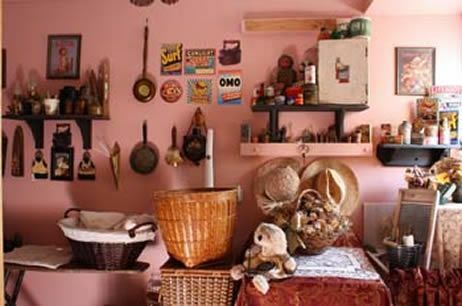 It’s ‘old world’ and modern convenience all rolled into one. 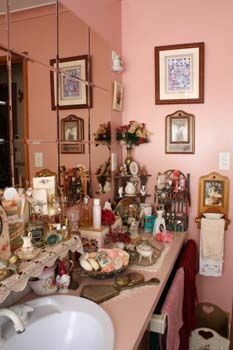 It’s treasures found and collections amassed, all artfully arranged with the panache of a professional. 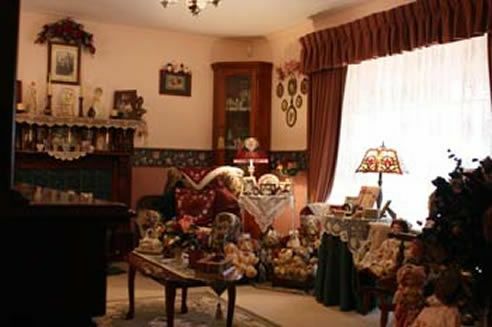 It’s testament to the love and passion of the people who live within its midst, it’s unabashedly sentimental … and Julie Craig wouldn’t have it any other way! However, for all its essential charm and intimate personality which immediately reflects that of its owners; for all its bespoke features and eclectic elements, the irony of the Craig’s home is that Julie really had little interest in moving here in the first place! 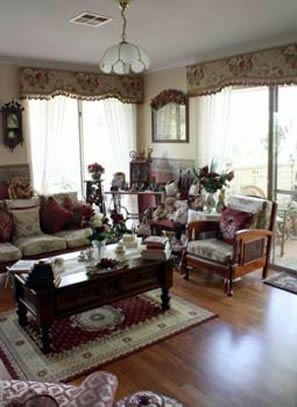 As she explains, she was more than comfortably ensconced in her previous home on South Australia’s York Peninsula. 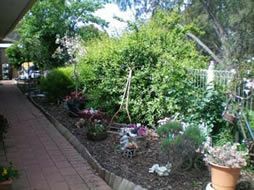 But when Andrew took her to look at the home on the outskirts of the Adelaide Hills about six years ago, she instantly knew that this is where she was meant to be. 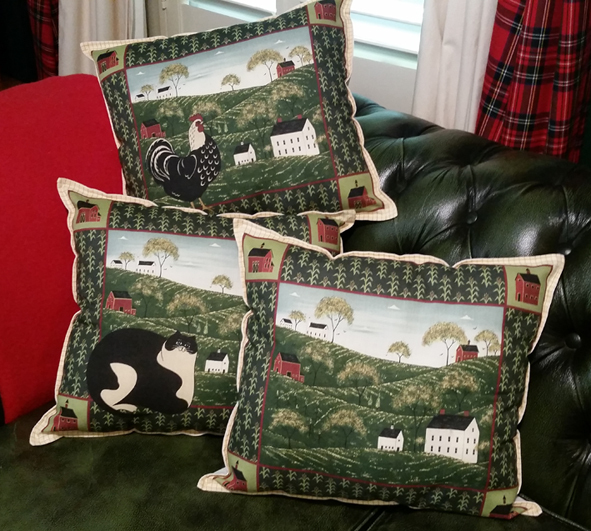 “Right down to the Victorian-inspired colour scheme and the floral wallpaper friezes, the mantelpiece in the lounge room and the rambling garden, I had an immediate ‘knowing’ that this was where we were meant to live” tells Julie. 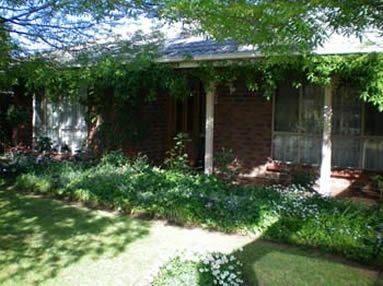 The brick home – which is now about 15 years old – boasts four bedrooms, making it ideally spacious to accommodate the couple’s brood of visiting grandchildren, of which Julie and Andrew have nine, by way of their three married children. 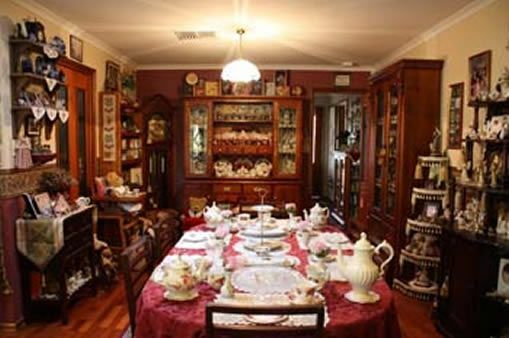 In addition to formal and informal dining areas and gorgeous lounge room (which is decorated in tribute to Julie’s passion for the English-inspired romantic look), there is also a marvellous country-style kitchen, impacting entrance and delightful undercover outdoor entertaining areas. In addition, a craft and rumpus room for the grandchildren has been created by closing in and converting an internal double garage. 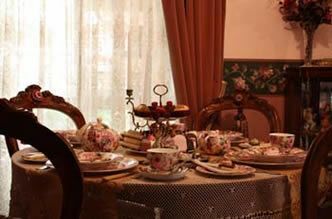 Throughout the entire interior, the colour scheme is inspirationally rich and nostalgic, with deep burgundy and plums, greens and golds figuring prominently within the chosen colour palette. The main sleeping accommodation, formal lounge and dining area is warmed with a beige wool berber carpet while the rest of the house features a floating timber floor which is wonderfully serviceable and adds an important ‘country’ note. Various bifold interior doors feature leadlight insets and reflect the style of the home’s handsome leadlight front door which opens into a welcoming entrance vestibule that instantly extends the warmest greeting to all visitors. 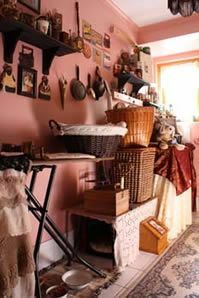 The style and feel of the entrance hall has then been replicated in the hallway at the back of the house which leads to a guests’ bathroom, sleeping accommodation and two ancillary rooms which are respectively used as offices for both the master and mistress of the house. Indeed, the entrance of the Craig’s home, and the garden just across the threshold outside, make a strong statement regarding the decorating delights inside the heart of the home, and pronounce the sentimentality and sense of old world ideals which permeate the entire property. 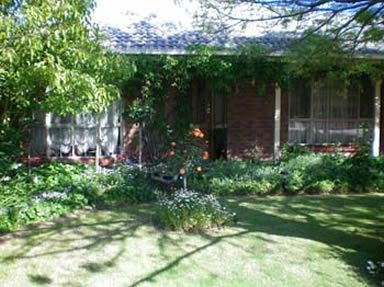 The front garden is dominated by a towering claret ash with underplantings of hyacinth, daisies, bluebells and other English-inspired spring flowers. The front portico has been renovated with ceramic tiling while a lush Boston ivy clings to the eaves above and adds an extra dimension of shade and greenery to the setting. 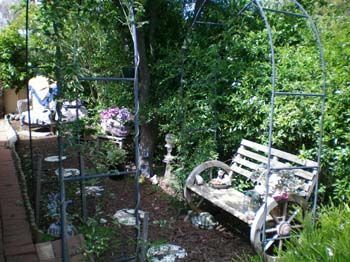 In other parts of the garden – to the sides and rear of the home – eclectic elements further reflect the decorating passions of the owners. 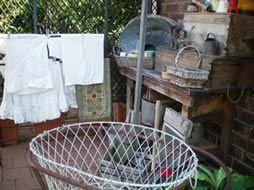 Julie has taken the approach of adorning the outside spaces just as she has done indoors, creating delightful vignettes and special points of interest along the way. 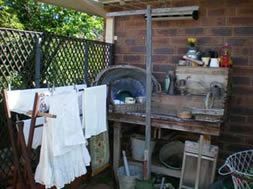 There’s a whimsical tribute to yesteryear washday blues; there’s an old bicycle and push mower display; there’s lots of statuary and potted colour; and in one corner of the garden there’s a very sentimental memorial to Julie’s late father. 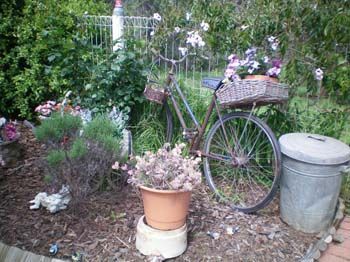 “I wanted my dear Dad to have his own special place with us here, and so, by way of a basket of his old tools, his hat and pair of Wellington boots, the rose head off one of his old watering cans and a geranium bush struck from a cutting that came from his garden in Moonta, I have been able to create a special tribute to a very special man” explains Julie. 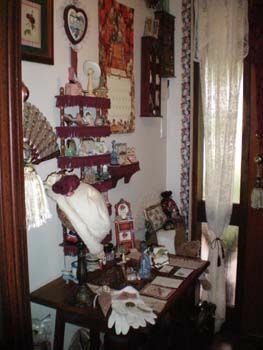 The many eclectic and collectable wares throughout the outdoor areas of the Craig’s home offer just the tiniest insight into the huge cache of treasured items and sentimental ‘souvenirs of life’ which are the hallmark of Julie’s decorating style indoors. 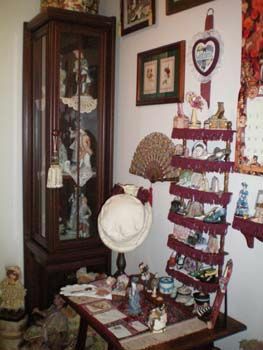 They greet all in the front entrance – where a collection of travel cases, resin shoes and hats, hatboxes, cabinet filled with Marie Antoinette figurines and a gallery of family wedding photographs are all artfully arranged – and accordingly populate every other room of the home beyond. 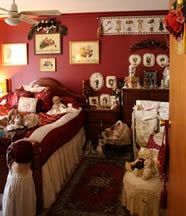 The main bedroom is just off the entrance at the front of the house, the room’s wide colonial-style window being dressed with opulent burgundy damask drapes which are topped with opulent fringed swags and tails. 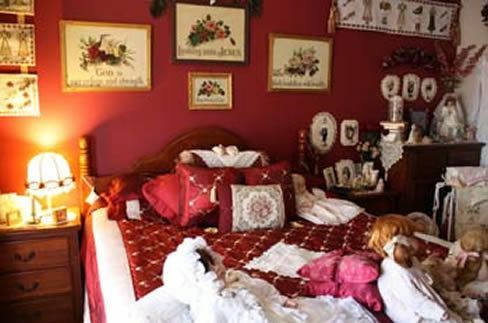 The walls of the room are a deep mushroom with a feature wall painted a rich burgundy, this being the perfect backdrop for a wonderful collection of vintage framed scriptural sayings. 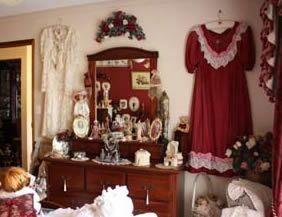 The room is softened with lots of collectables, teddy bears (one of Julie’s many weaknesses) and porcelain dolls (yet another) plus an array of vintage clothing (including wedding dresses), wedding paraphernalia, ephemera and endless memorabilia. 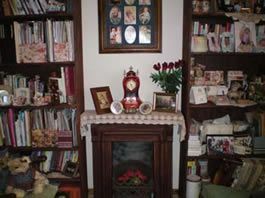 It all adds up to make the room the most intimate and personal within the home, and certainly a cosy, safe bastion at the end of the day. 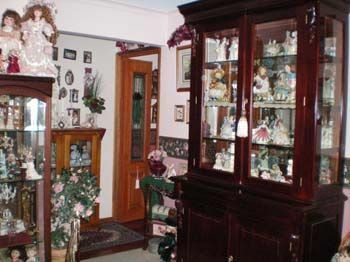 From here one enters the main formal areas of the home – the lounge and dining room. 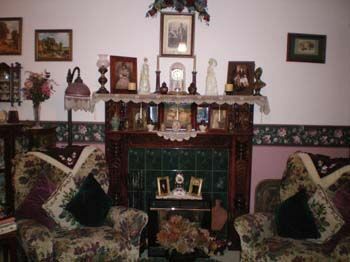 Both are decorated with walls painted deep plum to dado height and pale pink above, the two colours being divided by a rich floral frieze. 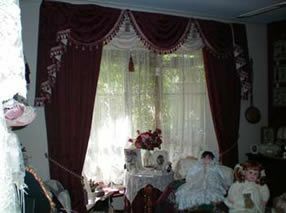 It is within these two rooms that Julie’s passionate penchant for the English Victorian look really comes to the fore. “I don’t know why I love the period English look so much” she muses … the joke resting in the fact that she originally hails from Southhampton which is in England’s Hampshire region and, although she has been here in Australia for nearly 40 years, she still retains a wonderfully broad English accent. 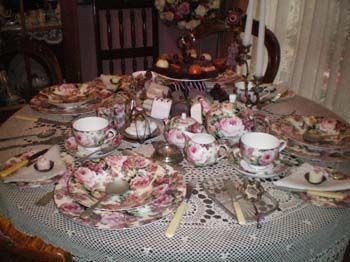 Julie’s English origins certainly go some way to explaining her love of such things as gorgeous old floral china and handsome period furniture, lovely lace and all things romantic and sentimental. 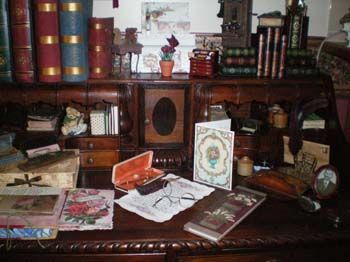 Ever since childhood she has been collecting things both ‘pretty and old’ and those which remind her of distant places and times long ago … especially of the days of Jane Austen when life was so much more genteel and cultured. 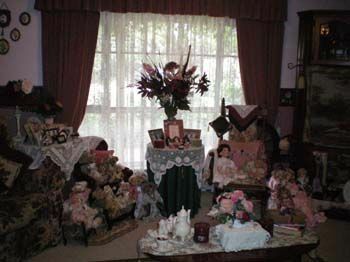 Thus the décor and style of the two formal rooms of the Craig’s beautiful home – from rich rosewood cabinetry to burgundy-toned floral upholstery on armchairs and a spring rocker, circular dining table and balloon-back chairs, elegant velvet drapes, a veritable shop’s share of china, bears and dolls, miniatures and a seemingly endless selection of sentimental collectables – is evocative of the drawing room or parlour of a traditional English manor home. 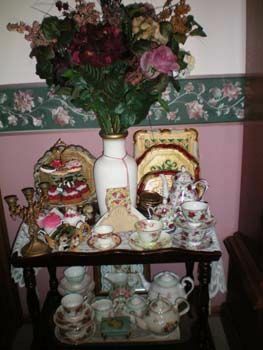 While the dining table is arrayed with a permanent display of elegant floral china – ‘Rambling Rose’ by Maxwell and Williams – as well as vintage cutlery and a wide selection of faux cakes in readiness for that next ‘high tea affair’, the formal lounge room is a showcase for some of Julie’s very special miniature displays, many of which she has created herself. 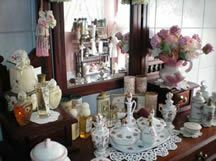 “I love creating miniature roomsets and shadow boxes as they mean that I can keep collecting and decorating even when the ‘real life’ house is brimming to the full. 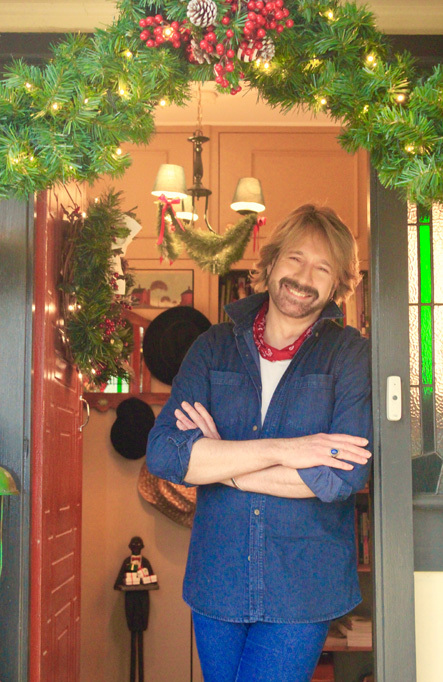 At Christmas time I even decorate all the tiny rooms just as I do the rest of the house, the whole process taking a good month … working at it every day, and at a steady pace” she laughs. One of Julie’s favourite features within this part of the house – and what she considers to be the crowning glory of the property – is an elaborate timber mantelpiece in the formal lounge which features deep green tile inset and gas log fire. 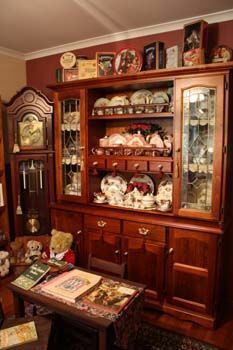 It truly creates the mood and feel of an English parlour and is a wonderful place to curl up and relax with a good book, especially when the ravages of winter set in. More informal living is enjoyed in the central rooms of the home – with informal dining and sitting room arranged in the context of a handsome country kitchen. 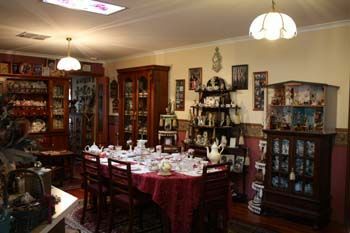 The relatively open-plan space echoes the colour scheme of the formal rooms with lots of freestanding timber cabinetry, Welsh dresser and Baltic pine cabinetry in the family room having been set in place to hold and showcase yet more sentimental collections, miniatures and other treasured possessions, photographs and souvenirs of a life lived. 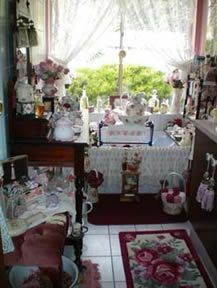 More china, vintage prams and two beautiful old dolls houses (meticulously decorated by Julie, right down to the handmade food and tableware she has fashioned from buttons, beads and Fimo clay) all make an important contribution to the colour and character of this key family gathering area. 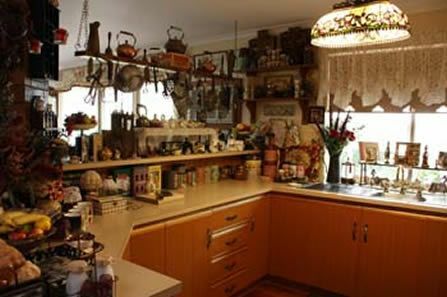 Despite the fact that the kitchen looks – for all the world – to be created from solid timber cabinetry, Julie tells that it’s all a deception! 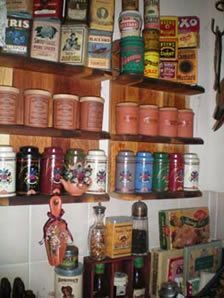 “I didn’t know what to do with the cream laminate cupboards. They were so much at odds with the warmth and colour of the rest of the space, so I covered them with woodgrain contact! I then spray painted the cabinet handles black and gold and added a lifetime’s collection of wonderful old kitchenalia … transforming it into a wonderfully warm cookroom and undisputed heart of the home” she tells. 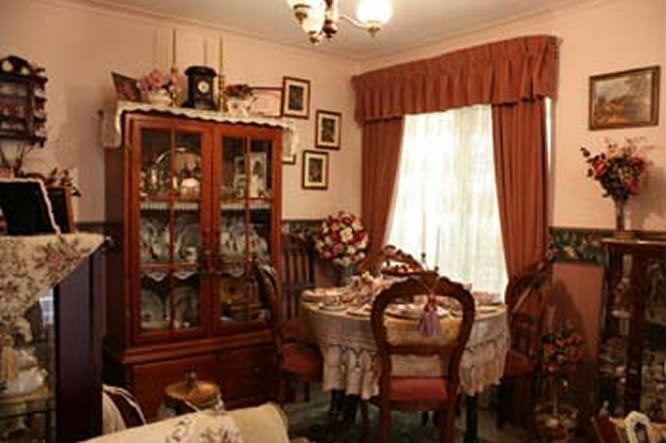 To the side of the kitchen – in the informal dining area – a six-seater table and chairs accommodates adult diners while the Craig’s grandchildren have their very own separate dining suite alongside … in miniature! 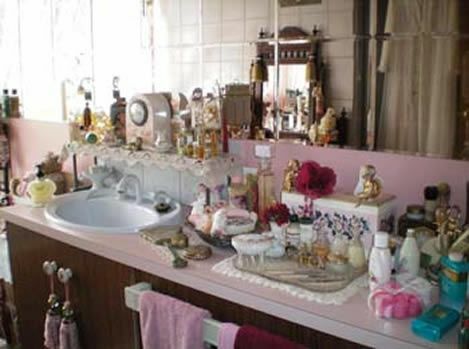 As would be expected, even the main bathroom and laundry of the home is decorated in step with the nostalgic, sentimental look that permeates every other part of the home and gives it its unique sense of character, warmth and ‘heart’. 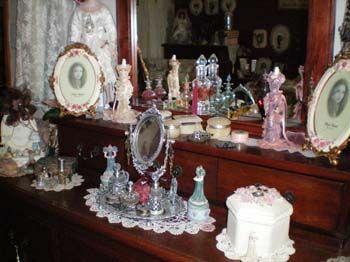 “While some people say that paring back is the modern-day trend and that one should shed all that is unused or superfluous, to me there is nothing more wonderful than being surrounded by the treasures that have been amassed over a lifetime, each one triggering sentiments and memories of special people, happenings and past times. These are the things that confirm who we are, where we have come from and tell us just how blessed we really are” states Julie. Blessings are indeed something that Julie Craig is always conscious of … and is always eager to share with others. 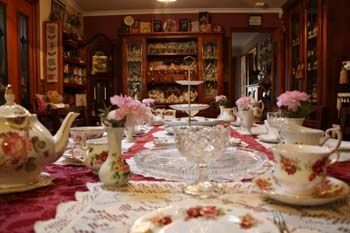 And so, over recent years, she has evolved a programme of regularly-conducted morning teas where she invites a hostess to gather together a group of like-minded friends who are invited into Julie’s home to partake in what she refers to as “a celebration of friendship in a bygone era”. 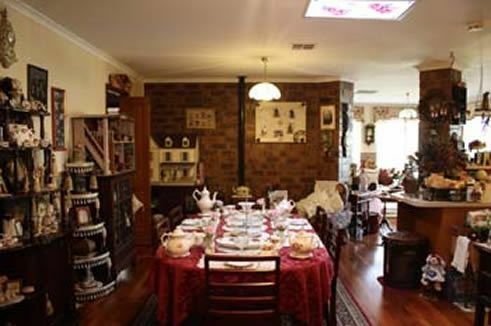 So successful have these gatherings been that, in recent times, Julie has been conducting a morning tea a week, with women from all over the region booking well in advance to enjoy a little slice of old world etiquette – and a good dose of frivolity – within the company of ‘jolly Julie’. Dressed as a Victorian housekeeper, Julie greets her guests at the door and provides them with an animated house tour before disappearing to quickly re-emerge in character as Hyacinth Bucket (pronounced ‘bouquet’) as the lady of the house hosts a beautiful morning tea – with all the trimmings – and lots of ‘good manners’ and guaranteed mirth. If home is truly where the heart is, it is undeniable that Julie Craig’s heart is lost in another time and another place. 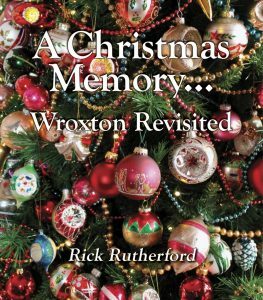 It navigates a sentimental course – to renew old memories, and to make a world of wonderfully rich, new ones – as she opens her home to kindred souls, dearest friends and family alike, each one being blessed to share in the unique warmth, rich colour and character of the world created by a very clever country decorator who happily travels a ‘sentimental journey’ through life!